As a home remedy, you could say Bombara figuratively wrote herself out of her funk, and her writer’s block at the same time. 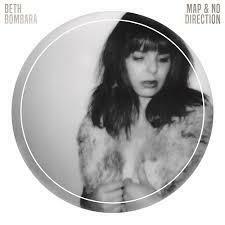 “I hadn’t written in a while, and songwriting became my meditation,” said Bombara. “That’s kind of how the song ‘Map And No Direction” got written. Album therapy seems to have worked. She has a better idea of what she wants to do, and “fun” is one of the ingredients that were missing. “It’s getting back to discovering why I loved music in the first place,” said Bombara. “There’s something about getting together with a group of people and playing. Whether it’s improvising or honing in on a song and working out parts. The collaborative effort is something I love. Just taking ideas and creating something from nothing is an inspiring and fun experience,” said Bombara. A trip to Portland Oregon to record “Map And No Direction” helped in that way. There, she worked with producer/engineer Karl Kling. Though she hadn’t collaborated on an album with her friend and fellow musician previously, she found renewal working with a new approach and new ideas. In Oregon she also played bass in another touring band. “That gave me a creative outlet, but it didn’t feel as daunting because it wasn’t my own music,” said Bombara. After being reinvigorated by the west coast trip, she had the energy to return to performing her own music, which itself became healing. “When you’re playing to an intimate crowd and whether you’re singing a serious or happy song, you can see the audience emotions connect with the emotions you’re trying to get across, that’s a very powerful thing that I love about music. It’s a universal language you can share with the audience,” said Bombara. St. Louis is where Bombara now calls home. The Michigan native has fallen into the Gateway music scene, where she has absorbed the sounds of that city’s rich r&b and blues history. You can hear the pop/folk/blues of Beth Bombara in a duo acoustic setting August 20 beginning at 2:00 p.m. at the Chillicothe, IL Public Library. Listen to the entire conversation between Beth Bombara and GLT's Jon Norton.